Things I liked: Well its certainly large, plenty of room for just about anything you would need at the range. The top is somewhat clear so you can see somewhat of the things in the trays. It has a holder for your jags and brushes but Im sure most are to long to use it. But you can remove it and discard if you want. That leaves you with a larg pocket for other stuff. The storage underneath is pretty big lots of room but with the gun cradles inside theres not to much left. Things I would have changed: Someone said they wished it was a little deeper. I agree just another inch or so deeper. What others should know: This seems to be well built and sturdy I could probably stand on it ( but thats only 165 lbs ). Its going to hold up under the weight of many tins of pellets. I have even use it as a shooting stand and it worked alright. Things I would have changed: I would like to see it a one piece box , more like a tackle box with the the top trays opening on both sides to expose the large bottom section , instead of have a 2 piece box. What others should know: This is a great box and has plenty of storage you will not be disappointed. 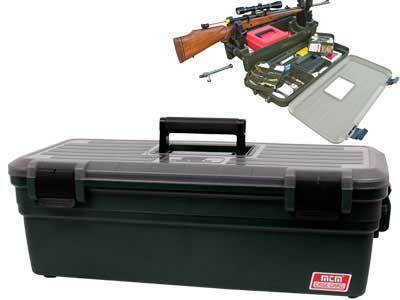 Things I liked: Very nice case, well thought out design, top detaches from the bottom very easily allowing me to care for my guns with all the tools I need in one convenient spot. Things I would have changed: Make the bottom just a little deeper just an inch or two. What others should know: Great case, worth the money.